Our Editorial Team is taking a Christmas break, but here are some posts from our regular contributors which were published earlier this year, so you have something to read while digesting all those left-over mince pies that you've decided to eat up! The EHFA team wish you all a very Happy Christmas, and we will return next week with new articles about all aspects of British History! Our Editorial Team is taking a break over Christmas, but we've selected a few highlights from the last twelve months for you to re-read in between bouts of turkey-consumption and games of charades. The Editorial Team wishes you all a very Happy Christmas and we will be bringing you lots more articles in the New Year! So, to reflect on what we have this far, there were several Ælfgifus or Ælfgyvas which was a popular noble name for women in the 11thc. The name itself means noble gift, and therefore likely to be a high-status name. We have the story of Ælfgifu of Northampton who was involved in some mystery around the paternity and even the maternity of her sons by Cnut, Harold Harefoot and Swein. Then we have the tale of Emma/Ælfgifu, Edward the Confessor’s mother who supposedly committed adultery with the Bishop of Winchester. Were there any other contenders for this woman’s identity? Yes, it seems to be so. Æthelred the Unready also had a wife called Ælfgifu of York, who was the mother of possibly all of the king's sons apart from the two youngest, Edward and Alfred, who were born to his second wife, Emma of Normandy. Do you feel that headache coming on? (Please let me know if you need to lie down.) But to complicate things even more, it is possible that there were two wives called, Ælfgifu, as some historians have believed, for there are two named contenders for her father, however, seeing as there is as little evidence for there being two wives as for the one, we may as well discount this fact. And so, seeing as we do not know of any scandal attributed to her, and her existence is as far away from the events of the mid 11thc as the moon, it is not beneficial to think that this lady is being represented on the Tapestry. So, is there any more Ælfgifus not mentioned as yet? There may be one other. Some historians have, in an effort to solve the riddle, gone for the simpler, but unlikely option, that Harold had a sister called Ælfgyva whom he’d promised to one of Duke William’s barons in return for his own alliance with one of the duke’s daughters. 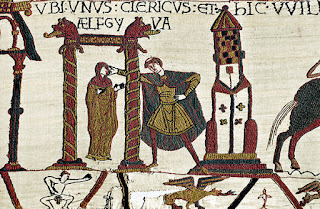 The lurid depiction of this woman called Ælfgyva and the cleric is said to explain a scandal of some sort that would have been common knowledge at the time. There are other stories that run along similar lines, but these also prove very dissatisfying, for they do not answer the riddle of the purpose of their appearance on the tapestry. Here now I think, would be a good time to objectively examine the scene and the ones preceding it. If we go back two scenes, we are looking at four horsemen riding toward a tower-like building with a man in the lookout pointing at the men as they approach. The words in Latin along the top of the tapestry read, Here comes Duke William with Earl Harold to his palace. The next scene has no written explanation but simply shows an image of Duke William sitting on his throne in his great hall, and a man standing behind him whose fore-finger is pointing toward the figure of Harold stood before the duke. Harold’s right hand gesticulates, open palmed the way someone might when he is explaining something. His left-hand points behind him and appears to be almost touching the hand of a bearded guard that is standing a little way from the rest of his companions. Obviously, the bearded man represents someone important to the story of the tapestry. 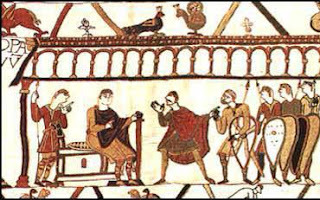 Curiously, this guard has not dressed his hair in the Norman fashion of shaving the back of his head to the crown, as do the other men in the image, Harold being the other exception. The guard also has a beard, which the others do not, having shaven faces. The artist seems to have gone to great lengths to distinguish this man from the others. Finally, the next segment shows the mysterious Ælfgyva standing in a doorway, presumably to convey a scene in a house, with a priest or monk reaching out to her, his hand touching her face and his other hand firmly on his waist. He looks as if he has taken a step toward her. He could be touching her face endearingly, or he could be slapping her face. It is open to conjecture. We will never know. Additionally, the scene in the border below show some very lewd figures. Underneath Ælfgyva, a naked man with a large appendage appears to be squatting, as though pointing under her skirt. In the scene with Harold and William, another naked, faceless man is bending over a work bench with a hatchet. 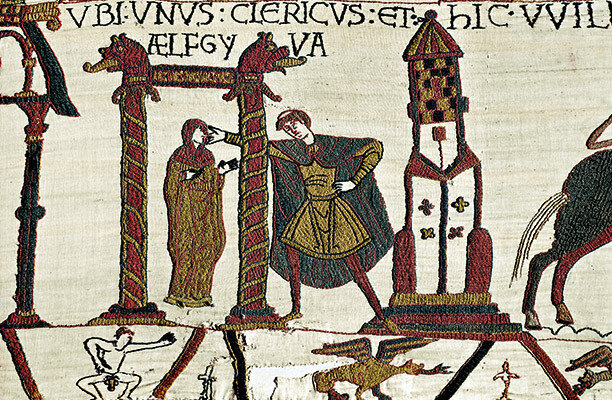 The meaning of these images are obviously of a sexual nature, but what connection it has to the mystery scene is really not clear, but possibly would have been to those who had lived around the time the Tapestry was crafted, and most likely refers to a known scandal of the time. 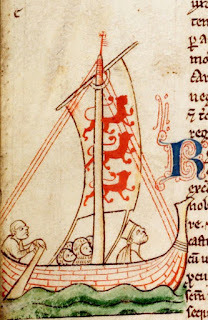 According to the Canterbury monk Eadmer, in his account (Historia Novorium in Anglia c 1095) of Harold’s mysterious visit to Normandy has the earl embarking on a mission to free his brother Wulfnoth and his nephew Hakon from the duke of Normandy’s clutches. A very different account to that given by the Norman propaganda machine, which has Harold travelling gaily overseas to meet with the duke, after being commissioned by King Edward, offering him his loyalty and promising to use his powers of persuasion with the Witan to have him as their king upon Edward’s death. The younger Godwin boys, were allegedly whisked away as hostages in some scheme possibly cooked up by Robert Champart, Archbishop of Canterbury, an arch enemy of Earl Godwin, sometime in 1052 when the family returned from exile. Champart may have used the hostages as a shield to help him escape without molestation, from Godwin’s revenge. Champart, being Norman, was sympathetic to the Norman cause. He may have schemed to persuade Edward to name Duke William as his heir. When the archbishop's plot went awry, and Godwin returned to favour, the earl was gunning for those who had played a part in his exile, especially the major player, Champart. The hostages were taken to the duke on Champart's escape to Normandy, supposedly, as according to Norman Sources, as surety of Edward’s and possibly Godwin’s word (though the latter would have been doubtful) that he would succeed to the throne of England. Even having to flee from England with a charge of treason over his head, did not deter Champart to stir up trouble and continue with his plan to see William as Edward's heir. It's also possible that Edward had secretly given his blessing to Champart to take the boys, hoping that one day the tide would again turn against Godwin, that veritable boil on his bottom. 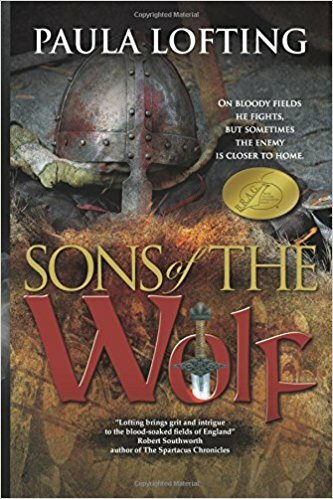 In the autumn of 1064, at the time when Harold's visit to Normandy was most likely to have taken place, Wulfnoth would have been a man in his late twenties and Hakon, a teenager. The former was Godwin’s youngest son, and Hakon, the son of Godwin’s eldest, son, Swegn. How they would have fared all those years in Normandy away from their country of birth and family, one might wonder. 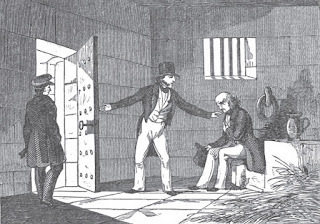 There are no records of their progress during their stay, however one can perhaps surmise that by the time Harold appears on the scene, they have got used to being hostages, well treated in respect of their nobility and having found positions among the duke’s household. 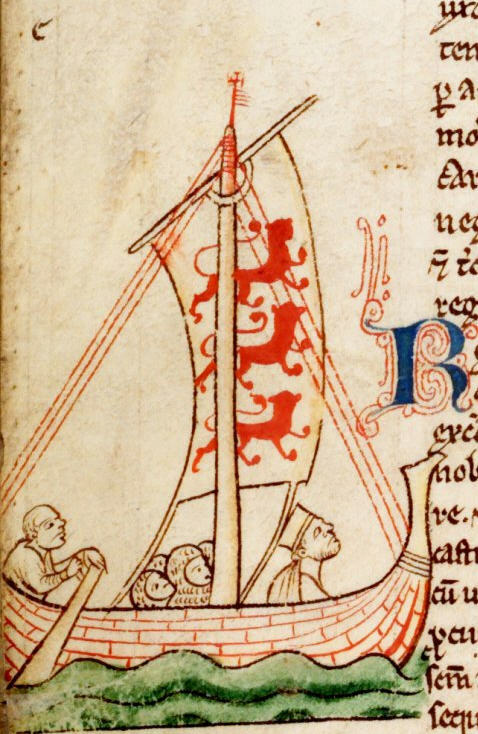 Eadmer’s version of Harold’s trip to Normandy takes a very different slant to that of the Normans, with the main purpose being to negotiate the release of Harold’s kin from the duke’s custody. In the Norman version, we are told that Harold arrived with gifts for William, gifts that it was said were for the duke from Edward, to confirm his promise of the ascendancy. Or were they boons of a different nature? Bribes perhaps for the release of Hakon and Wulfnoth, and not from Edward, but from Harold? So, the segments of the Bayeux Tapestry that we have seen above can be interpreted in as Harold and William discussing the purpose of his visit, which could be to discuss Edward's wish that William become his heir - or - it can be interpreted as Harold explaining that his visit is to talk about his kinsmen: brother, Wulfnoth, the bearded chap amongst William's household guard, and Hakon, his nephew. Whatever the case, both men, it would seem, had different agendas.... and how does the curious picture of the noble lady and the monk fit into all this? We have more to discover in the next Part. Walker I, Harold: The Last Anglo-Saxon King The History Press; new edition, 2010. Last time, I blogged about Culross in the ancient kingdom of Fife, which boasts a 'palace'. This time, I'm looking at a Fife town which is equally 'stopped in time' but which boasts a real palace, and a royal one at that. Like Culross, Falkland is a town which seems stuck in another time period, and, like Culross, it was used for a location in the series Outlander. Unlike Culross, though, it has not been renovated, or rebuilt, but simply it has survived, because of the royal palace situated in the heart of the town. It was not, as Culross was, dependent on industry and the local lord, but on the large community which came with the palace, and the trade which developed from it, and continued long after the kings had left. Falkland was created a royal burgh in 1458, but the palace reached its apogee with the reign of James V, (1512-1542) who brought it to its full Renaissance glory. Usually, stately homes and royal palaces are set at the end of long sweeping driveways, well away from other buildings. In Falkland, one merely steps from the main street into the gateway. James V kept a permanent staff of foresters, falconers, dog handlers and stablemen. In the 1530s the household accounts recorded nearly 350 named staff, including stewards, carvers, cupbearers, ushers of the outer and inner chamber doors, yeomen, grooms and a barber. Instructions to the master of the royal household, signed by James, included the edict that no one should enter or leave the court without proper authority, especially 'lads or vile boys'. It was at Falkland that James V died, in December of 1542. He had been visiting his mistress at Tantallon, and then spent a few days with his pregnant wife Marie at Linlithgow, before travelling to Falkland. He took to his bed, suffering possibly from either dysentery or typhoid. News reached him of the birth of his daughter, but he was disappointed that the baby was not a boy, having lost his sons the previous year. He died on 14th December and never saw his daughter. James V's body lay in state in the chapel inside the palace. He had lost interest in the building after the death of his baby sons in 1541, but his daughter, the future Mary Queen of Scots, had some of her happiest days here, and it's said that she frequently went hunting in the nearby hunting grounds. There is a unique feature in the chapel which is a window depicting her husband, Lord Darnley, as King Henry - the only place where Darnley is recognised as having been king. Falkland also has another boast - that of having the oldest Real Tennis court in Britain. It was built in 1539 for James V, and unlike other examples, it was designed and built without a roof. Walking round the inside of the palace, I discovered a nugget of information. In one of the bedrooms there was a great wooden dresser, and I learned the origin of the phrase 'bottom drawer'. It's common parlance, certainly in the UK, to talk about the bride's 'bottom drawer', the place where she will collect linens and suchlike prior to her wedding. I had never thought about what this meant in practice though, until at Falkland I was shown the 'top' part of the cabinet. The groom's job was to collect bulkier items, such as crockery, and then after the marriage, the two portions of the cabinet/dresser were put together in the marital home. I was also told the story which I'd first heard at Dunfermline Abbey about James VI, son of Mary Queen of Scots, and his journey to collect his bride, Anne, or Anna, of Denmark. His ship was blown off course on more than one occasion. Denmark was a country which had already conducted witch-hunts and James became deeply interested in witchcraft and its evils, convinced that it was this diabolical practice which had summoned up the storms against his ship. In 1589 James VI, had conferred the palace on his wife, Anna of Denmark, and in 1595 he renewed the town's status as a royal burgh. But once he became James I of England, he only returned to Scotland once thereafter, and to Fife, in 1617. The hand-loom linen weaving industry in Falkland grew out of the weaving trade which supplied the palace. Many weavers' cottages can still be seen in the town. The industrial revolution brought power looms to Falkland, and of the three factories established, one still survives today, producing paper and plastic bags, instead of linen. Many of the buildings display 'marriage lintels' - the two sets of initials and the dates may record a marriage, when the house was built, or the date the couple moved in. This building is the Covenanter Hotel, with its sign above the door declaring "Down with tyranny - we are and we will make free 1638-1688" This refers to the Covenanters, a Scottish Presbyterian movement, whose members were opposed to the notion of the Divine Right of Kings, one of the Catholic principles upheld by the Stuart monarchs. Richard Cameron was a famous Covenanter who was born in Falkland, although not, it seems, in this building. Incongruous indeed, to have a symbol like this so nearby to a Stuart royal palace. Charles II, before landing in Scotland in June 1650, declared by solemn oath his agreement of both covenants, having signed the Treaty of Breda with the Covenanters, and this was renewed on the occasion of his coronation at Scone in the following January, in 1651. Charles spent some time at Falkland palace following his coronation, but this was the last time a monarch stayed at the palace. Thereafter, the palace park timber was felled on the orders of Oliver Cromwell, and in 1654, Cromwellian soldiers, occupying the palace, started a fire by leaving a cooking pot unattended. Falkland palace was never again used as a royal residence, but its decline was halted by a restoration programme begun in the early nineteenth century, so that visitors can still enjoy its grandeur to this day. Annie Whitehead is an author and historian, and a member of the Royal Historical Society. 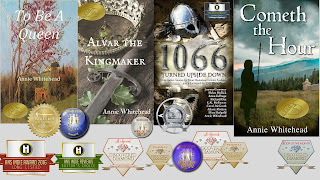 Her first two novels are set in tenth-century Mercia, chronicling the lives of Æthelflæd, Lady of the Mercians, who ruled a country in all but name, and Earl Alvar who served King Edgar and his son Æthelred the Unready who were both embroiled in murderous scandals. Her third novel, also set in Mercia, tells the story of seventh-century King Penda and his feud with the Northumbrian kings. She is currently working on a history of Mercia for Amberley Publishing, to be released in 2018. In 1234, Henry III of England was in his twenties and ready to wed. It was his obligation to marry a fertile wife, someone who would present him (and his kingdom) with a lusty, squalling heir. It was also his obligation to marry a woman who would bring other benefits, like a nice chunk of land or extremely valuable connections. It went without saying that a royal bride also had to be of high birth with a nice line-up of illustrious ancestors. After some consideration, Henry decided that the woman best placed to become his wife was a certain Jeanne de Dammartin. The lady came with various benefits, the principal one being that she stood to inherit not only the county of Ponthieu but also Aumale, thereby giving Henry III a foothold in Normandy and an opportunity to recoup on everything his father, King John had lost. Further to this, Jeanne also came with an impressive pedigree, being the granddaughter of the princess Alys, that unfortunate woman who was promised to Richard Lionheart as his wife, raised in England where she purportedly was seduced by her future father-in-law, Henry II, returned as soiled goods to France where her brother, King Philippe Augustus, hastily married her off to the much, much younger William of Ponthieu. Not that Henry III cared all that much about Alys’ unhappy life: the important thing was that little Jeanne had Capet blood in her veins. On her father’s side Jeanne was a Dammartin. Probably made Henry nod in approval, as the Dammartins had proved themselves to be loyal to the Angevin kings. So loyal, in fact, that after the Battle of Bouvines in 1214 (where Philippe Augustus crushed the English and their allies) Jeanne’s uncle, Renaud de Dammartin had been dragged off to captivity, fated to spend the rest of his life chained to the wall. 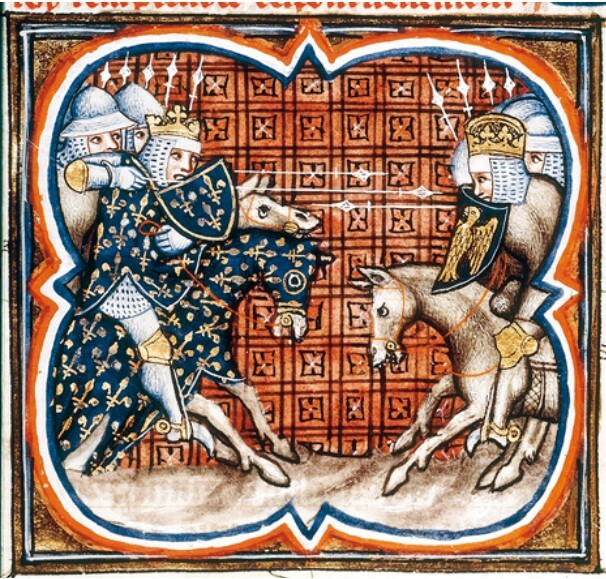 A harsh punishment meted out by Philippe Augusts who considered Renaud’s decision to support the Angevin to be doubly treasonous: not only had Renaud sworn to serve Philippe Augustus, but he was also one of Philippe’s oldest and best friends. Well, until Bouvines. Afterwards, that friendship was as dead as a rock. Renaud’s brother (Jeanne’s father), Simon, had fought with his brother at Bouvines. After the battle, he fled and spent a number of years in exile. His wife, Marie of Ponthieu, was left holding the can, so to say. Philippe Augustus had had it with the Dammartins, and when Simon’s father-in-law passed away, he therefore denied Marie her inheritance, which seems rather unfair as Marie’s father had fought for Philippe Augustus. Fortunately for Marie (and, indirectly, for Jeanne) Philippe died in 1223. 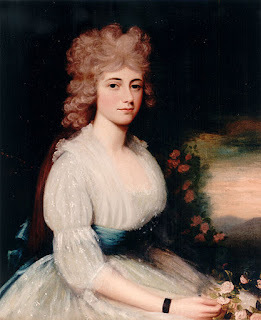 His son proved easier to negotiate with, so Marie was recognised as countess of Ponthieu and after a further few years of negotiation, Simon was allowed to come back home. To show his goodwill, Simon made a promise that he would not marry off any of his daughters without the consent of the French king. As an aside, it is interesting to note that his daughters were all born in the 1220s when Simon officially was exiled. I’m guessing that old adage “distance makes the heart grow fonder” was valid for Simon and his Marie as well, ergo a certain willingness to take risks to meet and hold each other. By the time Henry III decided to pay court to Jeanne, twenty years had passed since the Battle of Bouvines. So maybe Henry was hoping that bygones were bygones – or maybe he didn’t know that the Dammartin daughters could not be wed without royal French consent. Whatever the case, negotiations started in secret in 1234. Simon and Marie were likely delighted at the idea that their eldest would become queen consort of England, their grandson a future king. However, early in 1235 rumours about the proposed match reached Paris and the ears of Queen Blanche. This formidable lady was the widowed mother and regent of the young French king Louis IX and being a most conscientious and capable ruler, she wasted no time in informing Papa Simon that he could forget about marrying his daughter to Henry. The French king would not consent. Neither, it turned out, would the pope. Swayed by Blanche, he refused the dispensation Henry had asked for. Henry soon found a new bride. I am sure Blanche was delighted by the fact that Henry chose to marry Eleanor of Provence as this meant the new English queen was also the sister of the future French queen, Marguerite. But Blanche had one remaining headache: she somehow had to compensate Jeanne de Dammartin for the lost opportunity of becoming a queen. 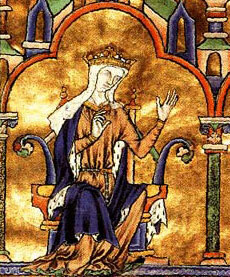 In 1235, Fernando’s first wife, Elizabeth of Hohenstaufen, known as Beatriz in Spain, died. By all accounts, Fernando and Beatriz had enjoyed a happy—and fruitful—marriage. 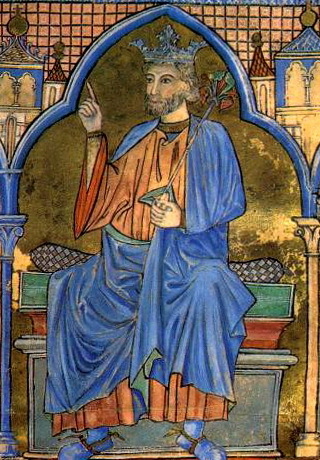 Now, the Castilian kings had a bit of a reputation when it came to women, but as long as Fernando had been married to Beatriz, he’d shown little inclination to stray. This may have been because Fernando spent most of his life fighting the Moors, women and leisure being something he rarely had time for. His mother Berenguela decided it was better to be safe than sorry and started looking for a new wife for her son. Blanche was quick to suggest Jeanne and Berenguela approved. 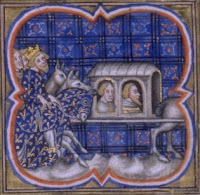 Instead of marrying an English king, Jeanne was now set to marry a Castilian king. Was she thrilled to bits? No idea. Rarely did anyone ask a young bride for her opinion in matters of dynastic importance, but I suspect the Dammartins weren’t too happy with this new marriage for their eldest daughter. After all, Fernando’s first wife had left him with at least nine surviving children of which seven were sons. It was therefore highly unlikely that any son of Jeanne’s would become king. Also, Jeanne was of an age with her eldest stepson, Fernando being close to twenty years her senior. Whether she objected or not, in 1237 Jeanne and Fernando were wed in Burgos. In 1239 she gave birth to a son, Fernando, who would go on to become Count of Aumale. Some years later, she gave birth to a daughter, Leonor. Three more sons followed of which two died very young. In 1252, Jeanne became a widow, her dying husband entreating his eldest son and heir to treat his stepmother fairly and with kindness. Not much of that around, as Alfonso never warmed to Jeanne whom he found severely lacking compared to his own saintly mother. Even worse, Jeanne conspired with Alfonso’s younger brother Enrique when this disgruntled gent threatened rebellion. There were even rumours that Jeanne and Enrique were lovers, but that should probably be treated as salacious gossip. Upon his deathbed, Fernando also commended the care of his younger children to his eldest son, and while Alfonso may have had issues with his stepmother, he seems to have genuinely cared for his half-siblings. Especially for Leonor. While Jeanne had been in Spain birthing babies, Henry and his Eleanor had been in England doing the same. Well, not Henry, obviously, but he was more than delighted when his eldest son, Edward, was born in 1239, interestingly enough at almost the same time as Jeanne’s first boy was born. Some years down the line and Henry started looking for a bride for his son. 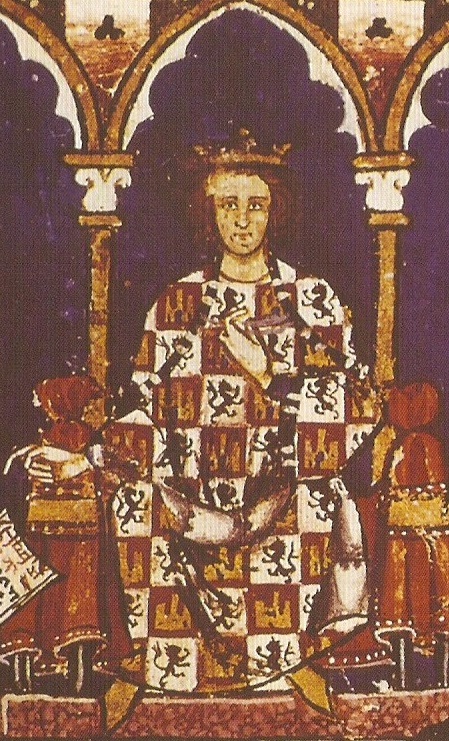 As always, a royal marriage was a negotiating tool, and in this case Henry wanted to come to some sort of accord with Alfonso X of Spain, this related to a dispute involving Gascony going back to the wedding between Eleanor of England and Alfonso VIII. 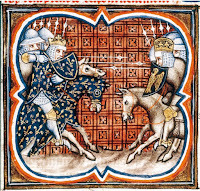 In 1254, Henry and Alfonso reached an agreement over Gascony. According to the treaty, Henry’s eldest son would marry Leonor (or Eleanor), at the time thirteen or so. Jeanne’s opinion in the matter was never asked for. After all, Leonor was an Infanta of Castile and it was her royal brother, not her mother, who had the right to arrange her life as it suited him. Besides, by 1254 Jeanne was no longer in Castile, having returned to France with her eldest son. Late in 1254, Leonor married the recently knighted Prince Edward. They would go on to have a long and happy marriage, albeit marred by all those babies who died. Something of a full circle, one could say, the son of Henry marrying the daughter of Jeanne. While Leonor—oops, Eleanor—adapted to her new life, Jeanne was enjoying the relative freedom of being a widow with a steady income. As Countess of Ponthieu in her own right she had the wherewithal with which to spoil herself and others. Truth be told, Jeanne had quite the indulgent side to her, so she happily spent far more than her income. Soon enough, the title passed to her son, but this did not stop Jeanne’s lavish spending and I am guessing her son was more than relieved when dear mama married again. Jeanne’s eldest son died in 1265, the title of Count of Aumale passing to his young son. 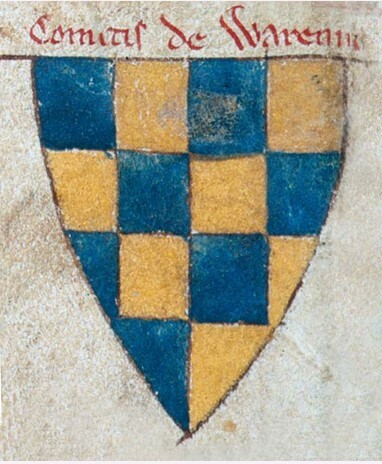 The title of Count of Ponthieu passed to Jeanne’s second surviving son, Louis, but he too was destined to die relatively young and due to the customs of Ponthieu, his children could not inherit the title. Instead it reverted to Jeanne. Upon Jeanne’s death in 1279, Ponthieu—and Jeanne’s huge debts—passed to Eleanor (and Edward). That piece of land which the French had been so determined to keep from the English king now became an English fief and would remain so until 1369. I wonder what Queen Blanche would have thought of that! Conisbrough Castle, the Grade 1 listed building, is an unbelievably beautiful place to visit, sitting on a prominent, steep hilltop that overlooks the picturesque village of Conisbrough in South Yorkshire; a village that itself has a long history and like a lot of the villages in South Yorkshire can be dated back to Doomsday Book. But, it’s the castle itself that really catches the eye and the imagination from people around the world - from being the inspiration to one of the greatest novels, Ivanhoe, to the legend of a ghostly lady wondering the keep, this Medieval Castle has it all and is one of Britain’s treasures. By all accounts William didn’t really do that much with Conisbrough, seeming to prefer his property at Castle Acre in Norfolk and so all that was achieved with Conisbrough was little more than a very basic castle, a wooden motte and bailey which would have been surrounded by palisades made of wood and earthen-works. The castle did stay pretty much untouched for the next three generations, as it passed from father to son and so on, and it wasn’t really until Isabelle de Warenne inherited the castle that changes really started to happen, and after that it stayed within the de Warenne family right up until the 14th century where the last Earl of Surrey, John de Warenne, died without heirs and all de Warenne land, including Conisbrough Castle reverted back to the crown. 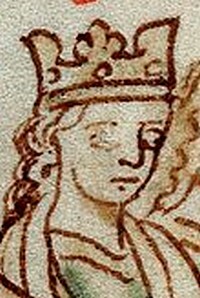 During the civil war between King Stephen and his cousin Empress Matilda over who controlled England, the Countess of Conisborough Castle was Lady Isabelle de Warenne, the daughter of the 3rd Earl of Surrey - who had died during his foray into the Crusades. Isabelle was by far one of the most sought-after women in England at the time; she was ridiculously wealthy with a title that dated back to William the Conqueror with some of the most sought-after properties in the country. Every man in England would have wanted her, but it was King Stephen that managed to align his house with the de Warenne estates. Stephen married Isabelle off to his son William, who most likely thought he had an advantageous arrangement – that is until his father made a deal with Empress Matilda that on Stephen’s death the crown would go to Matilda’s son, Henry of Anjou. William and Isabel seemed to accept what would happen and when Henry succeeded Stephen, William served King Henry II loyally until his own death. 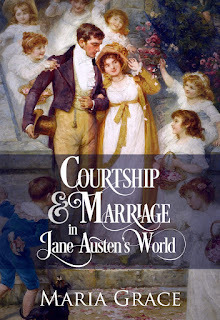 On the death of her husband, and without a child to pass on the title to, Isabelle was once again the powerful and much sought-after heiress and yet again regarded by England and the nobility as a great prize. 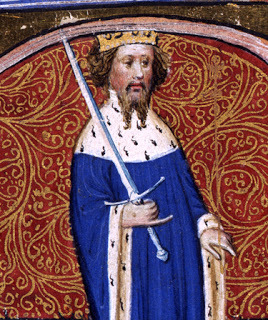 King Henry II, by all accounts, was desperate to unite his house with the Countess and in 1162 Henry’s youngest brother William was seeking a marriage with her, but his request was refused by the Archbishop of Canterbury, Thomas Becket, and William died shortly after – legend has it that he died of a broken heart after losing Isabelle. King Henry though was not put off by this and he was determined to get the de Warenne estates into royal hands, so he pushed for a marriage between Isabelle and his illegitimate half-brother Hamelin Plantagenet, and in 1164 they were married. 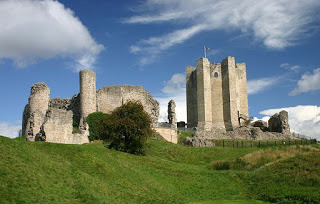 It was through Hamelin that Conisbrough Castle became the magnificent castle that it is today. Hamelin, I think, was a man who was decades ahead of his time - on his marriage to Isabelle he took the very unusual decision to take her name of de Warenne. Even though he would have been the Earl of Surrey on their marriage, he took on her family name as well. For me that speaks a lot about his character, it appears that he could have had a genuine fondness for his wife and in taking her name he was showing her the ultimate respect by honoring her family. Not just him honoring her family but the marriage by all accounts seems to have been a success, as they went on to have four surviving children: only son and heir William and three daughters Ela, Isabel and Matilda – even though it was rumored that Matilda was Hamelin’s daughter from a previous relationship and one of their daughters – it is believed to be Isabel - was reported to have birthed the illegitimate son, Richard Fitzroy, of her cousin and future King, John. Both Hamelin and Isabelle were very loyal to his brother Henry II. As well as his political work at court, Hamelin was busy having the castle renovated and brought right up to date. During the 1170s/1180s Hamelin had the mighty hexagonal stone keep built which is 28 metres (92 feet) high, the stairs to the keep used to be accessed across a drawbridge. The curtain wall (as it has been called) and the out buildings that lined the wall, which included the great hall and a chamber block which could have been reserved for servants – these were either built along the same time as the keep or added by William after his father’s death - and in 1189 Hamelin and Isabelle founded a chapel lain to be established at the castle. Once Hamelin’s nephew John became king, it is widely known that King John liked to stay at Conisbrough Castle for long periods of time, and cementing it as the de Warennes’ most principal seat. Over the next few generations life at Conisbrough Castle went along peacefully enough, passing from father to son, that is until the 8th and last Earl of Surrey, John de Warenne - who by all accounts was a bit of a character and John’s exploits changed Conisbrough’s future forever. John married Joan of Bar who was Edward I’s granddaughter, their marriage wasn’t happy – or even amicable. John tried and failed to be granted a divorce, and after this failure Joan decided to leave Conisbrough to live in London under the protection of Edward II, leaving John at Conisbrough to carry on living with his mistress. It was after Joan had left, that Conisbrough was center stage of political rivalry, sieges and a legendary kidnapping. 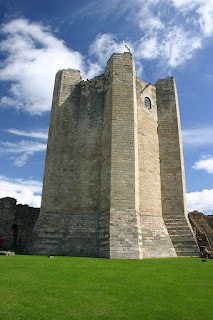 At one point the castle was besieged by Thomas, Earl of Lancaster and taken from John, only for Thomas to rebel against the King and who was defeated and executed. Conisbrough Castle was then again returned to John in 1326. Unfortunately, John died 20 years later without any heirs and all of the de Warenne lands and estates were reverted to the crown. 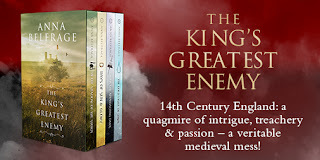 But in a way the castle was still connected to the de Warenne family, as Edward II handed his fourth son Edmund Langley - who was the godson of John de Warenne - the castle. When Edmund Langley died in 1402, the castle and the Dukedom were inherited by his elder son, Edward. His second son, Richard of Conisbrough, Earl of Cambridge, was left with nothing as his paternity was constantly in doubt, so with nothing to his name Richard had no choice but to lease a portion of the land from his brother. It was said that he was by far the poorest Earl in the country at the time. It was while living there that Richard was caught in a conspiracy plot to assassinate Henry V, for which he was tried and executed. Only three months later, Edward died at the Battle of Agincourt, and as Edward died without an heir, the castle and all estates were inherited by Richard’s son from his first marriage - Richard, the third Duke of York. After Cambridge’s death his widow and 2nd wife, Maud Clifford, decided to take up permanent residence at Conisbrough up until her death. In 1559 the castle was gifted to Elizabeth I, who didn’t seem to want to be burdened with it and passed it to her cousin Henry Carey, Lord Hunsdon. During the next couple of hundred years the castle passed from one family to another, no one seeming to want to bring it back to its former glory and all the while the castle was getting more and more ruined and dilapidated. 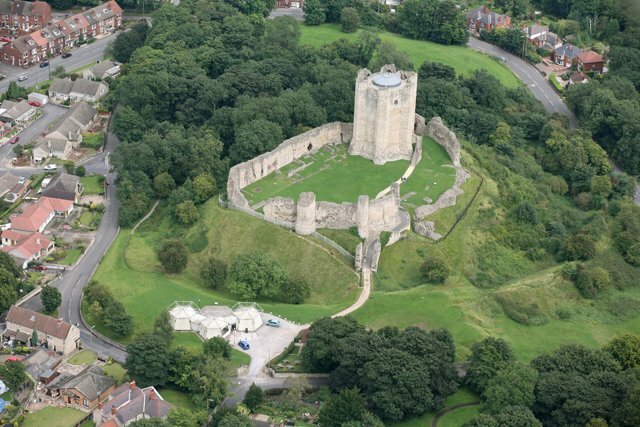 It wasn’t really until the early 19th century that Conisbrough Castle got the attention that is so deserved. After a trip to Doncaster Sir Walter Scott visited the ruins and he used the location in his best-selling novel Ivanhoe. In the book it called ‘Coningsburgh Castle’. Obviously, this got a lot of people’s attention and people were visiting the castle as a tourist attraction. In 1950 the castle was taken into state guardianship and in the 1960s The Ministry of Works began extensive repairs on the castle and during 1967-69 the castle underwent important excavations and later in the 1970s brand new stairs were built into the keep. It wasn’t until the 1990’s that The Ivanhoe Trust took over management of the castle and they re-roofed and re-floored the keep and finally in 2007 this historic building was under direct management by English Heritage. As Christmas approaches, we trim up our houses and trees, gather friends and family near and cook up some extra-special treats. Christmas in our household has always had its own special soundtrack too, and that enormous playlist that accompanies a Curzon December ranges from classical to rock and everything in between. Of course, carols are a huge part of any traditional Christmas and it truly feels magical to light the fire, turn out the electric light and spend an evening relaxing to the strains of Christmas carols, accompanied by a good book, a sleepy dog and something nice to drink. One of my favourite carols is Silent Night and, appropriately given my specialist subject, it’s a piece that has its origins in the long 18th century. It’s not strictly Georgian and, though it was written in 1818, it’s not Regency either because Silent Night first rang out across the snow-flecked land of Austria, far from British shores. In 1817 Father Joseph Mohr came from Mariapfarr in Salzburg to take up a position in a new parish. His new position was in Oberndorf bei Salzburg, where he was to serve as an assistant priest to those who worshipped at the St Nicholas parish church. Oberndorf was a small town, little more than a village, and the young priest was looking forward to his new role. A keen amateur poet, when he arrived in 1817 he was carrying in his bag a six stanza poem that would one day become famous. The organist and choirmaster at the church of St Nicholas was a man named Franz Xaver Gruber. 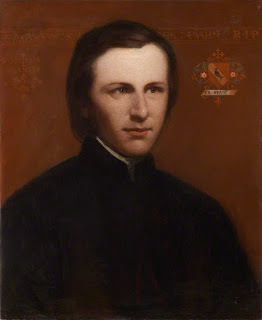 He and Father Mohr were soon friends and for two years they worked together harmoniously in the church, one preaching, one playing to the congregation. In 1818, Father Mohr was planning a midnight mass for Christmas Eve when he remembered that poem he had written two years earlier. His mind kept returning to the verses and he wondered whether it might do as the basis for a brand new carol that could have its world premiere at the mass. It was a simple poem celebrating the birth of Jesus and recounting the nativity scene around the manger, and it seemed to Father Mohr as though it would be perfect for the occasion. 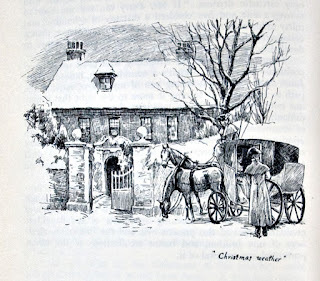 On a bitterly cold Christmas Eve, Father Mohr set out from Oberndorf and walked two miles to Gruber’s home in Arnsdorf bei Laufen. He showed Gruber the poem and asked if he thought he could set it to music in time for the mass that night. Together the two men went to the church of St Nicholas, where they began work. The church organ wasn’t working properly that night so Gruber sat down with his guitar - always his favourite musical instrument - and went to work. In just a few hours he had composed the melody that became famous as Silent Night. It was given the title of Stille Nacht and at the midnight mass, the choir of St Nicholas gave the first ever performance of the well-loved carol. Soon everyone was talking about the beautiful new carol that had been performed in the small church that night. As the years passed, it became an Austrian staple and from there, new arrangements began to be heard all over the continent. 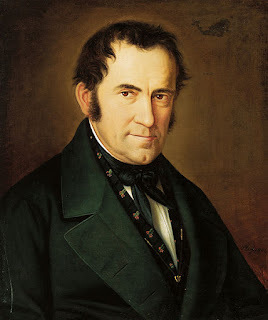 Gruber was deeply involved in creating many of these new arrangements, creating versions of the song for the organ as well as guitar and writing numerous other arrangements of traditional carols, which have become staples of Austrian Christmas services. Sadly the original manuscript created on Christmas Eve 1818 has been lost, though a manuscript in Mohr’s hand dated 1820 does exist. According to the popular story, Stille Nacht became Silent Night in 1859 when John Freeman Young, a priest in New York, translated the original German piece into English. He slowed the song down too and it’s this slightly different arrangement that is most well known today. Although it’s often heard throughout the advent period, Father Mohr actually didn’t intend for his carol to be performed on any day other than Christmas Eve and in Austrian churches, this is still the case. A few evenings ago, a large party assembled in the fine old dining hall of this college to listen to a performance of Christmas carols by the entire choirs of Holywell and St-Peter's-in-the-East. 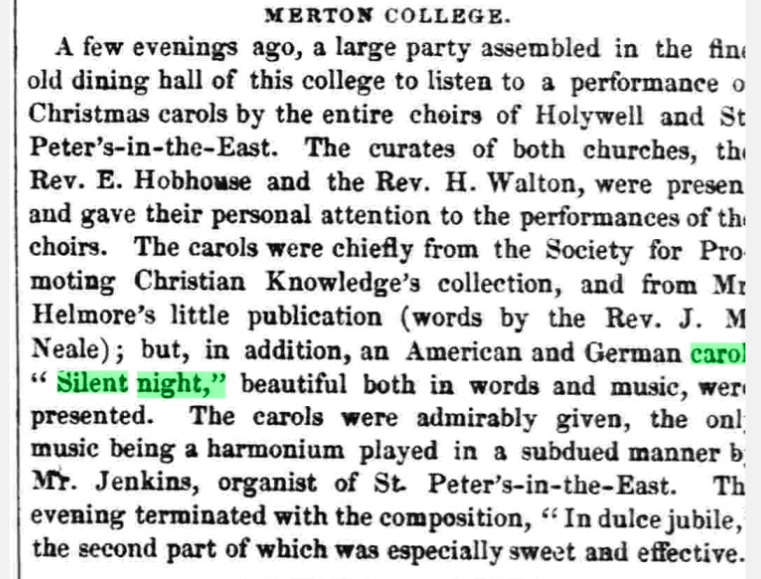 [...] The carols were chiefly from the Society for Promoting Christian Knowledge's Collection, and from Mr Helmore's little publication [...] but, in addition, an American and German, "Silent Night, beautiful in both words and music, were presented. 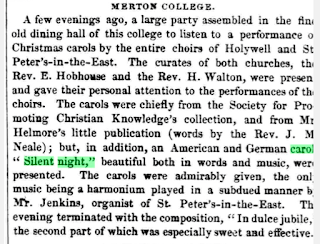 This appears to be the first mention of the carol by its English title in the British press, and it comes four years before John Freeman Young published his famous, canonical translation. Of course, the song must have had English translations prior to Young's setting it down in print and it's likely that this was simply one of the many unofficial arrangements and translations that were doing the rounds of Europe in addition to Gruber's own Stille Nacht cottage industry. We will never know the words of the translation that were performed in Oxford that evening but the image is a compelling one, with the scholars gathered by candlelight to listen to a version of the now legendary carol. Perhaps somewhere one of those hymn sheets awaits discovery but, wishful that thought is, it's unlikely that the version performed in Oxford will ever be ascertained. Sadly, the Church of St Nicholas where that carol first rang out no longer stands. After multiple instances of flooding, the church was demolished in 1913. In its place the Stille-Nacht-Kapelle, or Silent Night Chapel, was erected in 1937. 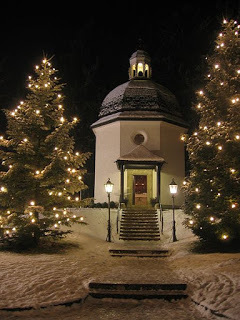 Every year, at 5pm on Christmas Eve, a mass is held at the chapel and Silent Night is performed in a variety of languages, recognising the people who have made the pilgrimage to Oberndorf. Those who visit say it’s a magical experience and the ideal way to start the Christmas festivities. Wherever you may be and however you may be spending the Christmas season, I hope yours will be peaceful, happy and one to remember! Cryer, Max. Love Me Tender. 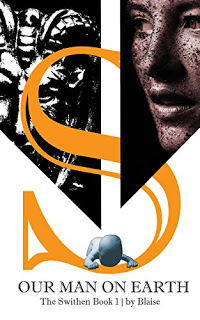 Exisle Publishing: 2008. Montgomery, June and Renfrow, Kenon. 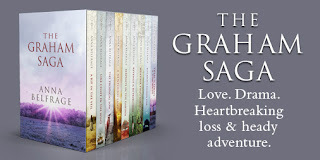 Stories of the Great Christmas Carols. Alfred Music, 2003. Mulder John M & Roberts, F Morgan. 28 Carols to Sing at Christmas. Wipf and Stock, 2015. Pauli, Hertha. Silent Night: The Story of a Song. Knopf, 1943. Scott, Brian. But Do You Recall? Lulu, 2017. 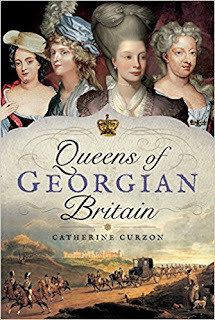 Catherine Curzon is a royal historian. She is the author of Life in the Georgian Court, Kings of Georgian Britain, and Queens of Georgian Britain. She has written extensively for publications including HistoryExtra.com, the official website of BBC History Magazine, Explore History, All About History, History of Royals and Jane Austen’s Regency World. Catherine has spoken at venues and events including the Stamford Georgian Festival, the Jane Austen Festival, Lichfield Guildhall, the National Maritime Museum at Greenwich and Dr Johnson’s House. In addition, she has appeared with An Evening with Jane Austen at Kenwood House, Godmersham Park, the Royal Pavilion, Brighton, the Jane Austen Festival, Bath, and the Stamford Georgian Festival. 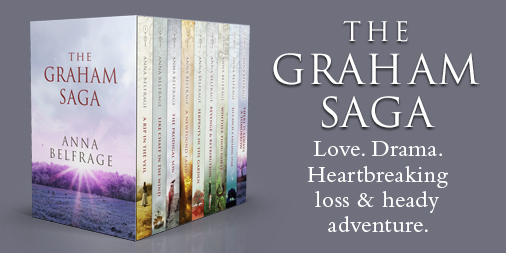 Her novels, The Crown Spire, The Star of Versailles, and The Mistress of Blackstairs, are available now. Catherine holds a Master’s degree in Film and lives in Yorkshire atop a ludicrously steep hill. Connect with Catherine through her website (http://madamegilflurt.com), Facebook, Twitter (@MadameGilflurt), Google Plus, Pinterest, and Instagram. Though gift giving was not the primary focus of the Christmastide season, gifts were commonly exchanged. St. Nicholas Day, Christmas Day, Boxing Day and Twelfth Night were the most likely days for gift exchange, although old traditions called for gifts to be exchanged on New Year’s Day. Many gifts exchanged were gifts of obligation between unequal parties. 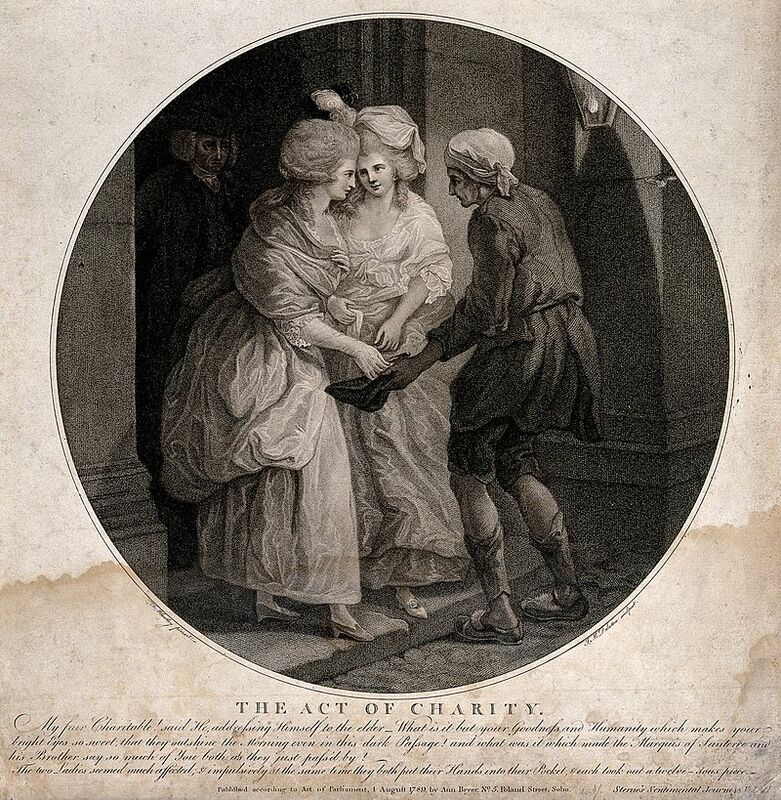 Land owners and the well-off presented charitable gifts to beggars and the poor of the community. They also provided favors to their tenants, servants and tradesmen they patronized. These tokens might be coins, food, particularly expensive foodstuffs, or castoff clothes and goods. Gifts might also be presented from those lower in status to those above them. Beggars offered songs, holly springs or simple handicrafts to their benefactors. Tradesmen might send special goods like Yule Candles to their best patrons. Tenants might bestow gifts of their harvest to the landowner in recognition of generosity and possibly to encourage him not to raise their rents. Social equals like friends and family also might indulge in gift giving, though men and women did not exchange gifts unless they were married, engaged or related by blood. These gifts were generally more personal in nature than obligatory gifts. Ladies might showcase their accomplishments in their gifts. Skilled hands prepared embroidered handkerchiefs and slippers for loved ones. Clever needles could create scarves, shawls, laces, trims and similar items. Paintings, drawings and other decorative arts graced a variety of gift items. 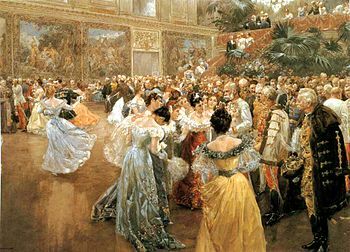 Gifts could be and often were purchased, with clothing and jewelry (especially that made with locks of hair) being among the most common items for both sexes. Books, sheet music, fancy boxes and supplies for activities like writing or handicrafts were also popular. Gift giving became more prevalent toward the end of the Regency period and into the Victorian. Advertisers began to run ads in periodicals suggesting novel ideas for gifts. One 1814 advertisement in Ackermann’s Repository suggested Marston’s patent stays and corsets, designed to comfortably support the weak and debilitated were a most acceptable gift for one’s parents. "Good King Wenceslas Looked Out On The Feast Of Stephen"
The traditional Christmas carol “Good King Wenceslas” points us to a 10th century start to the Boxing Day tradition. Wenceslas, a 10th century Bohemian Duke, surveyed his land on St. Stephen’s Day (Dec. 26) and saw a peasant gathering wood in the middle of a snowstorm. Moved with compassion, Wenceslas collected food and wine from his own stores and took them through the storm to the peasant’s home. His charitable deed became associated with St. Stephan’s day, making it a day for acts of charity toward the needy. 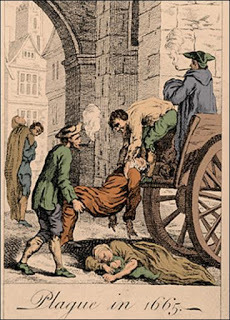 During the Middle Ages, churches maintained collection boxes for the poor. By tradition, these boxes were opened and the contents distributed to the poor on the feast of St. Stephen, the first Christian martyr. 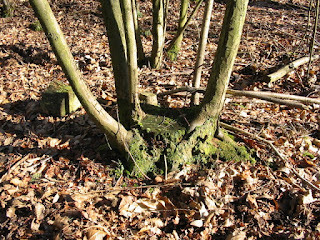 The association with the alms boxes may have led to the appellation, Boxing Day. Servants were often given the day off to celebrate Christmas with their families since their well-off employers required their service on Christmas Day. This may not seem like much to modern sensibilities, but servants had very little time off, much less coordinated time off with other family members. The day off on Boxing Day often meant than families could visit together even though they might work at different establishments. Old clothing and extra items were boxed up in ‘Christmas Boxes’ and handed out to servants and tradesmen on Boxing Day. Old clothing might not seem like a particularly desirable gift, however, in Jane Austen’s day, textiles (fabric and trims) were very expensive. Old clothes were only cast off if one was very wealthy. Otherwise, they were remade into other garments by taking them apart, re-cutting and possibly re-dying the fabric. When clothes could no longer be remade, they were used for cleaning clothes, rags and even made into rugs. A healthy trade in second hand garment also existed, so if the lucky recipient of the gift could use neither the garment nor its fabric, it could always be sold. Landowners and the well-off were expected to be especially generous on Boxing Day. 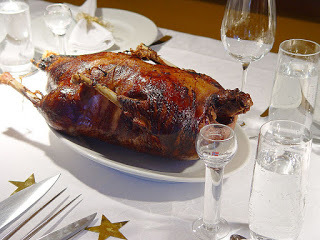 Many held a kind of open house on Christmas Day or Boxing Day for tenants and less fortunate neighbors. The more fortunate often gave food or money to those less so that they might celebrate on their own. Churches also collected money in alms-boxes during the season and distributed it to the needy after Christmas. A second St. Stephen, a 9th century martyr and patron saint of horses gave rise to another Boxing Day tradition, horse racing and fox hunting. Boxing Day also saw the start of Christmastide pantos. 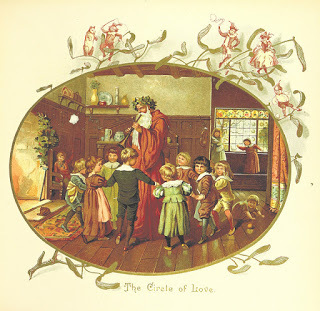 Rather than marking the end of the holiday season as we might consider it, Boxing Day started the festivities that would culminate on Twelfth Night. Enjoy our round-up of articles from the blog this week.